Enjoying landscape photography often requires that we have the right gear for walking and also, if we want to spend some time in the landscape, the gear for camping too. The Outdoor Show, now in it’s 11th year, obviously realise this as they now have a dedicated ‘Photography Village’ where there are a few exhibitors and some great speakers lined up. For instance, we’ve talked about cold weather shooting but Phil Coates really takes the biscuit working in temperatures down to -48 degrees (Thu/Sat), Jonathan Critchley will be talking about his ocean photography and his travel company ‘Ocean Capture’ (Fri/Sat), Tom Mackie will be talking about his long career in landscape photography (Sat), Andy Rouse about his career and new ideas for photography training (Thu/Fri), Charlie Waite will be talking about his new pictures of Libya and also about where we get our influences from (Thu), Colin Prior about his stunning mountain photography (Fri/Sat), Ben Osbourne about his recent wildlife projects (possibly about shooting for an opera about evolution - Sun) and Joe Cornish talking with Andy Rouse on Saturday - "Inner Visions", a wander through sets of new images and on Sunday his presentation is called "Viewfinder" and is about how we find our images and what it means to be a landscape photographers today. Andy and Joe have prints up at the exhibition so if you want to see some new work, get yourself down there! Alongside these there will be talks by shipwreck explorers, sherpas, professional adventurers, wildlife trackers, travel writers, climbers, outdoor magazine editors and much more. What a line up! Paramo are exhibiting at the event too and they will be featuring some new products they are distributing, F-Stop camera bags, and I can personally testify to the quality of the product having ordered one well before I heard about this. I have the Tilopa BC, a bag that weighs a fraction of the competition and has various design features that give it some big advantages. Paramo are giving a 20% discount on their own products at the show but just for paying On Landscape subscribers they’ve given us a special discount of 15% on Torres gear (smock, trousers and sleeves) and 10% off F-Stop gear for the whole of January. 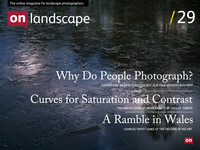 Drop us a line at info@onlandscape.co.uk in order to get a discount code. Finally, we’ve got two one day tickets to the first paid subscriber to comment on this post! We’ll be down at the show this Thursday and Friday reporting on as much interesting stuff as we can. We hope to see you there!